Property 17: Attractive Cottage A Pool With A View of the Rio and Portugal.Walks from Gate. Property 42: Comfortable small holiday home in Lugar Sao Pedro, North of Portugal. 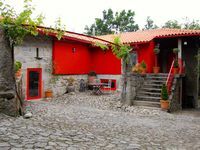 Property 46: Outeiro Guest House, Ponte de Lima, Minho Portugal. ChaletVintage | At "ChaletVintage" we offer the perfect getaway. Property 47: ChaletVintage | At "ChaletVintage" we offer the perfect getaway. We are a family of two adults and two kids. We stayed in Jose&rsquo;s house in mid august 2018. The house is a lovely, rambling country house. 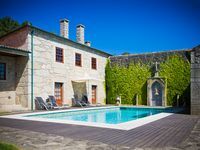 Essentially its a traditional Portuguese country house with huge thick granite walls and granite courtyards outside. This means that its cool inside in whatever temperature. The house is on a hillside and is terraced into the hill. It has huge gardens with terraces in them, these are half wooded. On the highest level, there is a great pool with steps down into it, its perfectly in the sunniest place. There is a large table for 8 and seating next to the pool for lounging and sunbathing, with umbrellas etc too. Lots of sleeping room in the house for 9 or more people. Nice sitting room for the evening, Kitchen with 8 person table, another table outside kitchen for eating outside. Great facilities. Nearby there are local villages with plenty of August fiestas, Caminha has good beaches and further round you get to surfer beaches, close to get to spain, 1 hour to Vigo. 1 hour to Porto. Very close to Vinho Verde vineyards. Supermarket is 5 mins by car and is big. Local facilities all very good. The house owner, Jose and family are Porto based and really friendly and helpful people, just want you to be happy. Overall, we really enjoyed the peace of this lovely green setting, traditional house and pool. Thanks for your help Jose.